Several people have been e-mailing me following my lecture on Jesus the Jew and the Jewish beginnings of Christianity at the Museum of Natural Science. The question they want answered is how this rabbi became God in the Christian communities. This has always been the central question to studies of Christology and there have been many scholarly models which have varying amounts of success taking into account the vast amount of written evidence. What is certain is that Jesus was not being worshiped as a god by his disciples during his life. This came later after his death. The question is how long it took to happen, and how it happened that a "monotheistic" Jewish sect took on the worship of a second god. I have worked out my own model and published the bones of it in a piece called, "How We Talk about Christology Matters," in Israel's God and Rebecca's Children. But I have decided to run a series of posts on the subject following Easter, the day of the resurrection. We will explore many items here, without Christian apology, to determine from the written evidence what likely happened all those years ago. I want to begin by ditching the language of Christology that we have used in the past, particularly the "high" and "low" narrative. This is apologetic language developed out of Protestant seminaries that places judgment on the Christological narratives of the early Christians. If a Christian text says that Jesus had human parents and was a prophet, it is said to be "low" Christology and "adoptionist" because God adopted Jesus as his son. If a Christian text says that Jesus was of virgin birth and was the Son of God, it is said to be "high" Christology and "incarnational". This language locks us in a paradigm of development from "low" (which must be earlier) and "high" (which must be later). It locks us into a view that "high" Christology is preferable to "low" Christology (a contemporary church view for certain!). And it breaks down once we get a text that says that Jesus was born of human parents but was worshiped as God (a branch of Ebionites), or that Jesus was a created being (a super-angel) and yet was worshiped as God (Arius), or a number of other known cases. Even Paul (whose letters make up our earliest testimonies) is hard to discuss within these categories, so we practically have to bend over backwards to "make" his testimonies "fit" our pre-conceived paradigms. So it is time to get rid of the old language and paradigms, and put something new in place, something that we grow out of the evidence, without apology for Christian theology which has its own agendas. It is this new paradigm that I intend to blog about. Next time: what made the first Nazoreans, the first Christian Jews, christologize in the first place? This looks like an interesting project. I'll be following it. The first question... maybe you have answered it before, but I missed it, is what leads you to this position? What is certain is that Jesus was not being worshiped as a god by his disciples during his life. This came later after his death. I've always found the evidence in either direction to be somewhat sketchy. I see evidence showing an early tradition on some sort of divine standing to Jesus - I just don't see what shows clearly that this either 1) wasn't worship as God, or 2) as early as his own life. Could you refer me to an earlier post explaining this, or briefly summarize the evidence you find compelling on this matter? I am very excited about this! I look forward to reading this series. Thanks so much! I, too, eagerly look forward to reading this series of posts. Thank you, April, in advance! I'm really looking forward to this series of posts. I am particularly interested in this very issue, so I'm glad you are addressing it. Richard E. Rubenstein wrote an interesting book called "When Jesus Became God: the Epic Fight over Christ's Divinity in the Last Days of Rome." (1999) No doubt you know of this book. What may have contributed to this was the apparent apostolic custom of applying certain verses from the Hebrew Bible to Jesus that were applied in original context to God, for example, Hebrews 1:8-12. And what led to that development was likely something about Jesus himself that resonated with those who listened to him and who observed him. 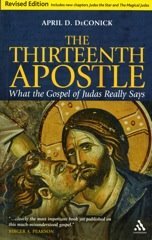 Check blog: "My decision about the Jesus Project", Comments April 2, 12 for one approach to "put something new in place, something that we grow out of the evidence, without apology for Christian theology - -"
The Comments' basic historical premise follows from the fact that there were two movements, the Jesus Movement and the Pauline Christ Movement, only the Christ Movement had an explicit Christology. Read the Comments. Correction to April 15 Comment. "Check blog: My decision about the Jesus Project, Comments April 12, 13, 17 - -." My master's thesis dealt a bit with the Messianic Secret in Mark. I am working on an article now in which I am trying to take a new approach towards secrecy in Mark that does not involve the Messianic Secret. For this article I decided to re-read William Wrede's work on the subject. I find it interesting that Wrede poses the question of whether or not Jesus was self-aware of his messiahship. Did Jesus consider himself to be a god, or was this something imposed on him after the crucifixion? What does Jesus' messiahship, self-proclaimed or not have to do with this issue? I think the self-awareness question would be a good place to start. How did Paul walk into a 1st century synagogue, tell the assembled Jews that they should worship a recently convicted criminal , because he was their God, and walk out alive? I am not aware of any evidence of "Paul walking into a 1st century synagogue to say anything" in the writings of the N.T.or in the works of Ogden, Robinson, Betz,or Merrill Miller. My understanding is that Paul was about founding Gentile churches propogating his Christ myth gospel. As Paul and Barnabas were leaving the synagogue, the people invited them to speak further about these things on the next Sabbath. If this is fictional, then surely some Christians must have visited a synagogue some time. Why weren't they just killed straight off as blaspheming idolators? Apologies, I am mistaken, after all I am not a scholar. I do wonder just what you mean to convey by Paul being accepted in a synogogue? I agree with your abandoning the "high" and "low" language regarding christology. I do that, and explain it in my preface, in my new book, The Restitution of Jesus Christ. I think you would really like to see this book. Now, it is available only on my website at servetustheevangelical.com.This book may be the most fordiable, well-researched, biblically in-depth book to ever challenge the tradtional view that Jesus is God while also affirming all other major church teachings about Jesus.